MEXICO CITY (CNS) — Since being named archbishop of Buenos Aires in March, Cardinal-designate Mario Aurelio Poli has shown similarities in the pastoral approach of his predecessor, Pope Francis. “He’s a lower-profile person, he listens a lot, talks little and is very friendly,” said Jose Maria Poirier, director of the Catholic magazine, Criterio, in Buenos Aires who has interviewed both Cardinal-designate Poli and Pope Francis at length. “He’s a person permanently consulting with the pope. … It’s no surprise to anyone that he has been speculated about (for) this possible appointment,” he added. “He is a great pastor. He’s a person close to the people. … He’s a well-trained person, very self-effacing with his introduction, he’s very clear in his few words,” Poirier told Catholic News Service by telephone. The Buenos Aires archbishop, 66, was among the 19 churchmen that Pope Francis named cardinals Jan. 12. He was among the six cardinals from Latin America to be elevated, reflecting the pope’s preoccupation for a region where he has proposed re-evangelization, despite its deep Catholic roots. Following Pope Francis and his example in Argentina will be no simple matter, however. In Buenos Aires, Pope Francis was a towering figure. He left a legacy of living austerely, walking the streets of the slums, taking the metro and declining social events. He also provided attention to the poor and spoke out on political matters, angering President Cristina Fernandez de Kirchner and her predecessor and late husband, Nestor Kirchner. Cardinal-designate Poli, like other senior clergy in Argentina, takes public transport and lives simply. He also continued Pope Francis’ tradition of promoting interfaith dialogue in Argentina. He does not call attention to himself, and both Padilla and Poirier described the cardinal as more of a pastor than a political man. 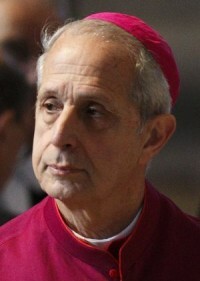 Padilla said Cardinal-designate Poli prefers the Argentine bishops’ conference, not him, weigh in on political matters. Cardinal-designate Poli showed his conciliatory attitude by condemning acts of vandalism against one of the oldest parishes in Buenos Aires, but also publicly asking for a meeting with the assailants to understand their motives and address any grievances, Poirier said. The cardinal-designate’s concern for the poor comes, in part, from his training. A native of Buenos Aires, he was born Nov. 29, 1947, and earned a degree in social work from the University of Buenos Aires. At 22, he entered the archdiocesan seminary and was ordained to the priesthood in 1978. He earned a doctorate in theology from the Pontifical Catholic University of Argentina and served in a parish before being assigned as superior of the seminary, then director of the San Jose Vocational Institute. Named an auxiliary bishop of Buenos Aires in 2002, he continued teaching at the Catholic university. He was named bishop of Santa Rosa in 2008, the ministry he held until Pope Francis named him his successor in Buenos Aires two weeks after becoming pope. As a member of the Argentine bishops’ conference, he has served on the commissions for Catholic education and for ministers. He is currently president of the bishops’ Commission for Catechesis and Biblical Ministry.